You’re safe around every bend! 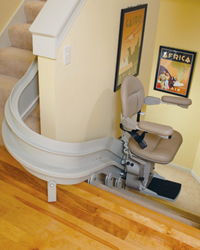 The Indy Curve is the ultimate in customizable stair lifts. Created to fit the exact specifications of your stairway, this stair lift has the ability to reach around every corner of your staircase. With the ability to mount on either side of your stairs you have the freedom to gain freedom without being inconvenienced. Requiring very little maintenance due to its direct drive motor, the Indy Curve operates by plugging into your household outlet as well as two 12-volt batteries; this allows the stair lift to continue lifting even during a power outage. The Indy Curve supports up to 400 lbs with a seat width of 21.5” to fit a range of body types. A smooth ride and smart design takes the Indy Curve beyond your average stair lift. Curved stairways are literally a challenge to get around, and a fixed stair lift design does not provide the right fit. Have a stair lift in place that goes around the exact curves of your stairway and meets your physical needs by installing the Indy Curve. A customizable curved stair lift, the Indy Curve is fitted exactly to the design of your stairway. No compromises are made; instead, the Indy Curve goes around every turn and mounts to either side of your staircase. 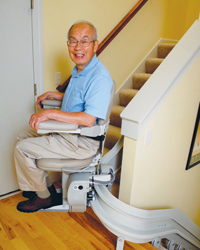 Equipped with a direct drive motor, the Indy Curve Stair Lift operates during power outages, has a large swivel seat, and supports up to 400 pounds. Uses direct drive motor/gear box. Designed with a vertical rail to leave plenty of space for guests. Instant unit status using visual diagnostics. Operates using two 12-volt batteries along with common household plug. Arms, seat & footrest fold for your convenience. Adjustable seat height and armrests. Seat swivels at upper landing. Optional upper or lower landing park position for additional stability when entering and exiting. Manual or power folding rails. Power Swivel Seat for upper landing exit and entry. Power Folding Footrest that automatically lifts and extends when seat switches position.